Sensors Contain Precision 100 Ohm, Class B DIN Platinum Thin Film RTD Elements in 3-Wire Configurations. Standard Temperature Range is -50C to 260ºC with PFA Insulated Cable. Optional High Temperature (500ºC) Fiberglass Insulated Cable Configuration is Also Available. These RTD sensors are used extensively in plastic processing for measuring mold and equipment temperatures, and other applications where easy installation and removal are required. 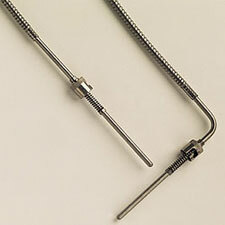 These sensors are installed using a spring loaded bayonet cap, mating adapters are also available (see BTA-1 through 6 depending on length needed). Standard configurations are based on the most popular lengths, with straight sheaths and with 90º bends. The included flex hose over the cable protects the wires from damage in rough environments. Standard terminations include spade lugs and Omega's OTP heavy duty connector (round pins). For other lengths of armoured cable, change “-60” in model number to length desired and add $3.50 per foot over 5' (60"). Other probe lengths available, price is $5 + $1 per inch over 6". For high temperature construction (500ºC), add “-CC” to the model number and $10 to the price.